Previously we learned how cavitation bubbles cause noise, vibration, and damage to centrifugal pumps. Today we’ll see how cavitation bubbles degrade pump performance in a centrifugal pump’s low pressure section. 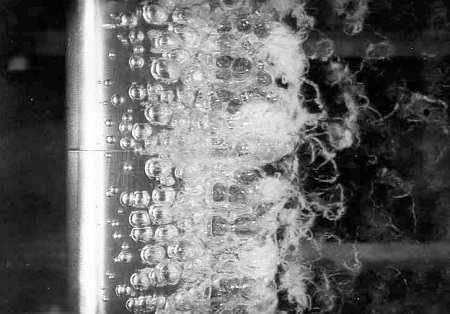 During cavitation multitudes of tiny steam bubbles form and become suspended in the water that’s constantly flowing through a working centrifugal pump. These bubbles decrease the density of the water because steam bubbles are lighter and occupy less space than liquid water. This decrease in the water’s density causes the pump to be less efficient, because for any given amount of horsepower that’s conveyed to the pump’s impeller by an external power source, the pump’s ability to promote water discharge is compromised due to the bubbles. As an example, let’s say that when the bubbles of cavitation form inside a pump, the pump’s water-bubble ratio is a mixture of 70 percent liquid water and 30 percent steam bubbles. That’s a lot of bubbles, and they act to restrict water flowing through the pump’s inlet, reducing flow rate by 30 percent. As water moves from the inlet towards the spinning impeller, all the steam bubbles implode in on themselves in the high pressure section of the pump. They return once again to their liquid state and join the rest of the water flowing towards pump discharge, but despite this the pump’s flow rate remains reduced at the discharge. We’ll find out why this is true next time when we discuss the engineering principle of continuity.